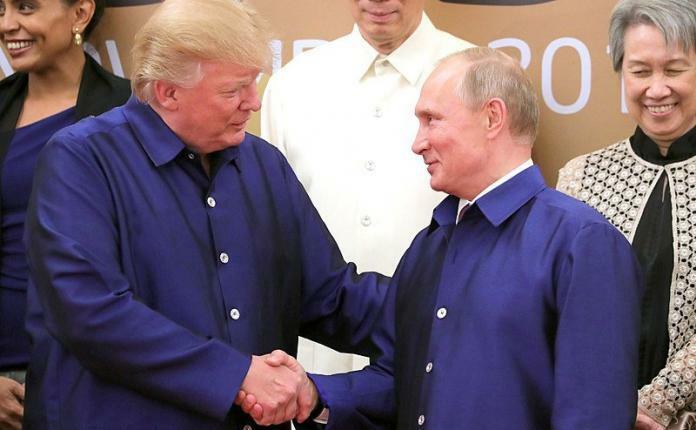 US President Donald Trump has applauded his Russian counterpart, Vladimir Putin, for being re-elected. Trump also expressed that he anticipates an imminent meeting between Putin and himself as Russo-American tensions are strained due to long-standing allegations of Kremlin meddling in the US voting system. Trump’s praise of Putin was met with widespread criticism in Washington from both sides of the political spectrum. Many top senators in Trump’s own Republican Party outright labelled the Russian election as a farce. Mitch McConnell, the US Senate Majority Leader cited a “lack of credibility” in how the results were tallied in the Russian election. Upon being asked if the election was fair and free, Sarah Huckabee Sanders, the White House spokesperson said that the US did not “dictate how other countries operate”. President re-elect Putin recently won a sweeping victory in the continuation of his dominance over Russia, the world’s largest country. Putin will now be in Russia’s top officer for another 6 years while his relationships with the West become the most hostile they have been since the height of the cold war. On his praising Putin, Trump said he congratulated his Russian counterpart on “the electoral victory”. At the White House meeting with Saudi Prince Mohammed bin Salman, Trump continued saying that his call with Putin was also about “the fact we will probably get together” in what he referred to as “the not too distant future”. Despite Trump’s claim, The White House confirmed that there had been no specific plans made for a meeting between the US President and Putin. John McCain, a prominent and well-respected US senator who recently left the senate due to health concerns, criticized Trump for his call with Putin. McCain said that the US President should not be “congratulating dictators on sham elections”. Recently, Trump was forced to introduce new sanctions against several Russian individuals due to Kremlin cyber-attacks into the US energy grid. Many of the individuals target in these sanctions were named as participants in the alleged Russian cyber-hacks designed to meddle in the 2016 election in the United States. Despite running in 2016 on a platform that included improving ties with Russia, Trump has so far been unable to create the strong relationship he described he would have with Putin. Now it seems that US animosity towards Russia and Trump’s forgiving nature are at odds.